I make my own vanilla too. I also like giving my vanilla as a home made gift. 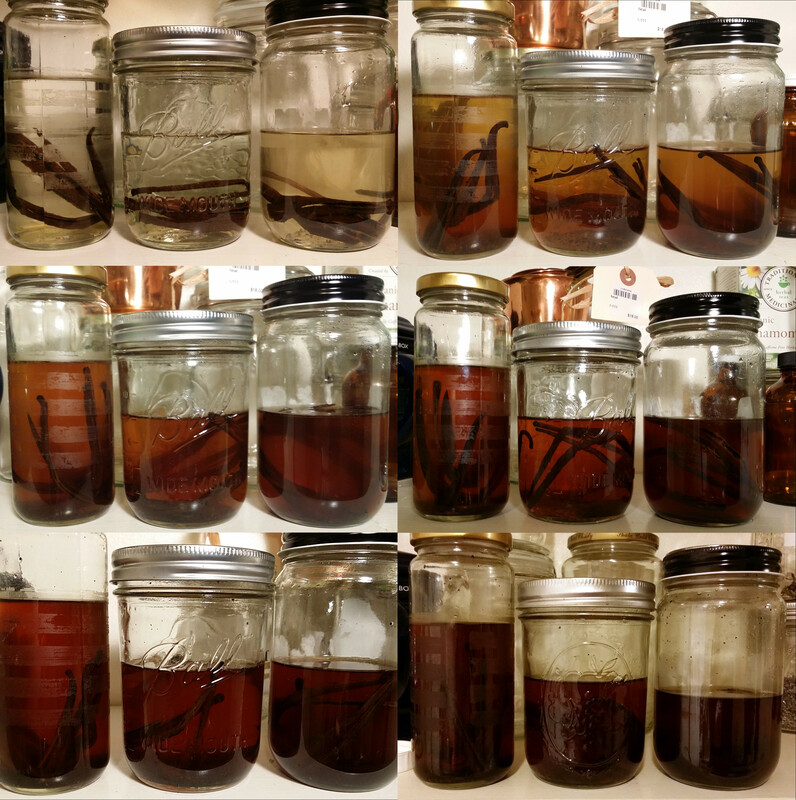 I’ve gotten many people to start making their own vanilla extract this way, and others ask (politely!) for a refill because store bought pales in comparison. I just made a bunch of vanilla for Christmas gifts! It’s so much better than store bought! I use brandy for mine and I get my beans online in bulk, but that does come with some packaging unfortunately. These are great instructions, thanks! Thank you. It’s such a wonderful gift. I think I’ll start some this weekend for Christmas presents. That will give it over three months of curing. Even if your beans have some packaging, it’s less than a bunch of bottles and yours would taste better too. I’ll try brandy this time. Do you have a favorite brand you buy? 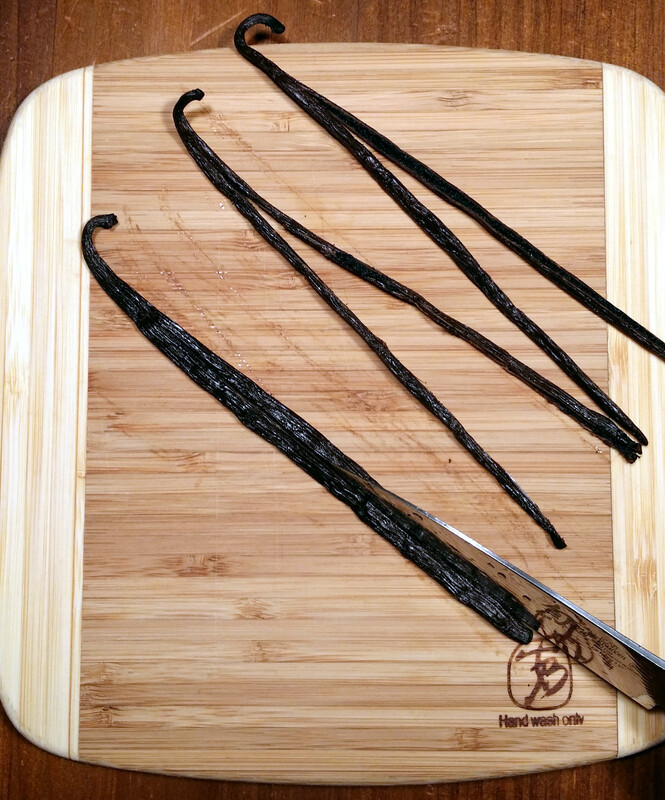 I have yet to see bulk vanilla beans where I live, but would love to make my own vanilla extract! I know all the stores are different but my Whole Foods carries them in the baking aisle. There’s a little section there with bulk tea and bulk spices. I had never looked for them until I made this, and I was surprised to find them there. My local Winco has the best selection of bulk for our needs and are generally super inexpensive. However, their vanilla pods come in small plastic vials, 2 for $9. Is vanilla just getting super expensive and do you get yours plastic free? Wow that sounds so easy! I love the photo on the top, showing the changes over two months or so. Do they sell the vanilla beans in places like Whole Foods? I don’t think I’ve ever seen then, but maybe I’ve just never been looking close enough. I can’t believe how easy this is to do. I’m going to try some with bourbon or rum next. I’m glad you like the photo. I love making collages. That’s my new favorite thing to do. I bought my beans at Whole Foods in the section with the teas and spices. At my store, that’s in the baking aisle, not in the bulk section. What a great idea. I love that you photographed your jars through the whole process. I’ve always used the sugar method, but this would work where that one doesn’t so much. It would probably work for other flavours like lavender which I do in sugar too. Thanks for the tip about weighing it in the bulk stores. That is quite a difference when you are not only paying for the container, but at the same rate as vanilla. Oooh, you put lavender in sugar? Do you make lavender extract? I’m glad you found the bulk tip helpful. I was pretty shocked at the cost of the weight of my bag. Have a nice weekend! Vanilla Planifolia orchids sell for about $8 USD. They are hardy in Zone 10 and can be grown as houseplants elsewhere. OMG I COULD GROW VANILLA!!!??? That would be so awesome! Thank you! oh clever you , I have never thought of it duh!!!???? You make olive oil too?! Yum! Yay! I’m going to go check on mine right now. I’m glad it turned out. And thanks for the tip on making vanilla sugar. I’m going to try that! Not at all. 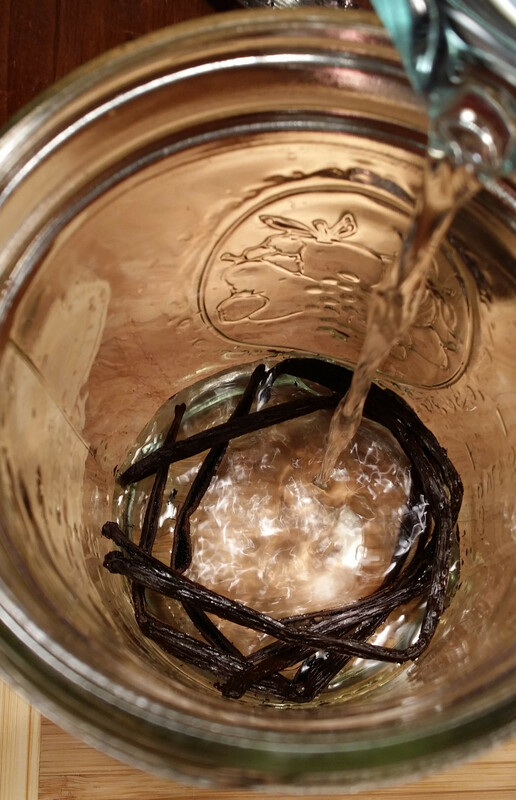 Vanilla beans might cost less where you live. Here, they are a bit expensive. Oh well, then they are expensive there too. But fortunately you don’t need very many and you can make a lot of vanilla out of a handful. We use 4 oz. of vanilla GF extract every two months. 24 oz per year. You’re inspiring! Thank you 🙂 I was so excited when I discovered I could do this. Is vodka gluten-free? It’s made from potatoes (I think), so can you use it? And when life gives you homemade vanilla, you gotta make homemade vanilla ice cream… 😉 PS, I make mine in bourbon. Guessing there’s a slight taste difference depending on which liquor you use. I guess I’ll just have to do make ice cream. All in the name of blogging material of course. I have read that the vanilla taste varies depending on the alcohol you use. I’ll have to edit my post and add some info about the different types of booze. Thanks for mentioning that. I know vodka is pretty neutral. I’ll try something else next time. Great! Thank you so much for spreading the word! Perhaps this is a silly question, but is this vanilla alcohol free? I would like to make it some time, but do not wish to consume alcohol. I make my own vanilla also. My parents ferment their own alcohol so I have bottled 40% proof alcohol with no vodka flavouring. I use 1 litre glass bottles and fill with whole vanilla pods so the seeds don’t float and the liquid doesn’t need straining. I buy the vanilla pods in Bali when I visit there (very cheap) and squish them into the bottle, approx 20-30 pods. Then fill with the pure alcohol. Within a day the colour changes from clear. I don’t shake it or anything, simply leave it in the back of the cupboard until my previous one runs out. 1 litre usually lasts a year. The vanilla is then a rich dark brown colour and the smell is pure heaven. No need to worry about the alcohol content as it’s such a small amount & the alcohol cooks away. Makes great gifts in little bottles too. I would never use store bought vanilla as once u use this home made version you’ll know why. The flavour is so strong and natural. Simply yummy. I’ve just started my vanilla today. We had a bottle of rum that was given to us ages ago (and will not be used if not for this recipe) that I thought would be perfect. I’m in Australia and two Organic Vanilla beans cost $8. I’m not complaining though considering the rum didn’t cost a cent. I cannot wait to try it in a couple of months. That’s great. DIY vanilla plus use-it-up resourcefulness. That does seem pricey for the beans though. Enjoy your vanilla! Hi, I started my vanilla extract about 2+ months ago, but I still can smell vodka and none of vanilla to speak of. Could that be because I didn’t use vanilla beans big enough? I took 4 and used 400 ml of vodka, so it’s more like 2 per cup instead of 3. Can I fix it by adding more beans? Or do I just wait longer? Thank you! The color is pretty dark and it LOOKS very promising, like the one in the left bottom picture showing your jars. I don’t have any more beans, but I sure can buy them. So something is happening in the jar. Well if you’ve already come this far, you may as well add a couple more. Try to find very fresh beans. That should help. Thanks for sharing. 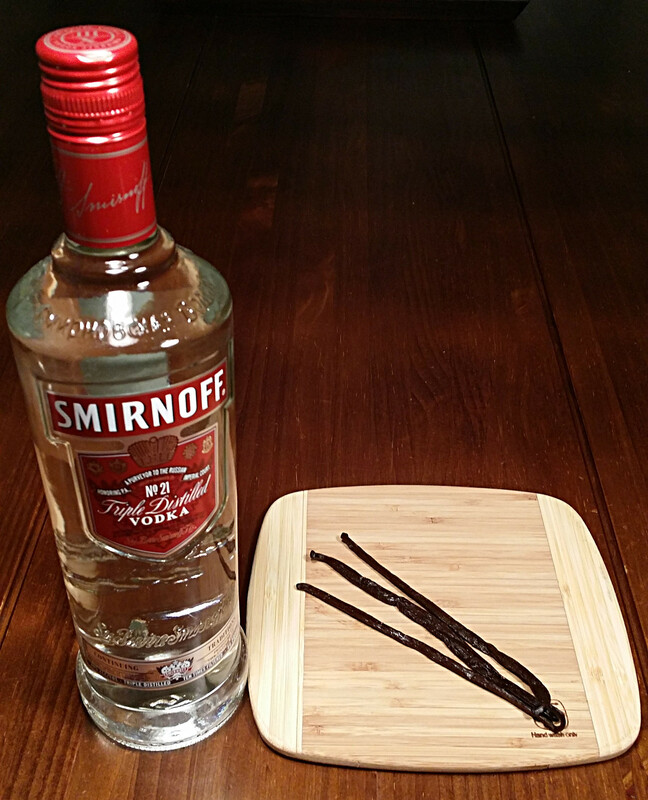 How long does homemade vanilla extract last? Does it ever expire? My pleasure! I have a little bit left of a batch that I made likely in 2015. I don’t think it does expire. The cheapest vanilla beans I’ve found in my area is 7.99 per vanilla bean! And I thought that must be good until I read the comments hahaha how did you find yours so cheap?